I didn’t make 2015 goals this past January, like I have for previous years. Too cold. Too tired. Too discouraged. I’ve held off from making them throughout the spring, because I didn’t know what the situation was with Tristan’s foot. I’m going to go out on a limb now and set a few summer 2015 goals. 1) Get back in shape. Both of us, for the love of little green apples. 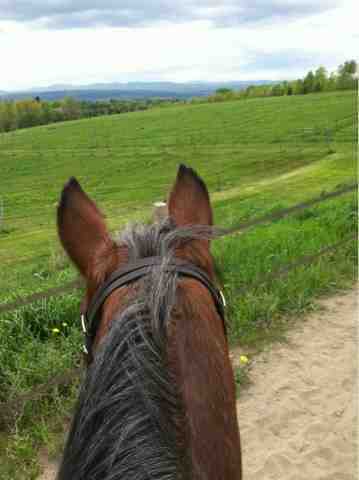 Able to once again actually ride instead of putter around. Ideally ready for a full lesson by August. 2) Be ready to show in the fall. There’s a small on-farm schooling show every September. I’d like to see if I can enter us in a Training test or two. 3) Volunteer more. I’ve teared up reading all the tribute posts to Seema Sonnad. What a rare soul. I love volunteering – just look through the tag here and you’ll see a million posts – and I want to make a commitment to do as much as I can this summer. I’ve already got one show on my schedule in August, but I’ll look for something I can do in July. I missed my favorite spring event at King Oak due to moving and being otherwise insane, but I can do better. Next Post How Do You Tell Time at the Barn? Come to GMHA this weekend and help me with the ARP Social I'm putting together… fun? !